There’s no shortage of al fresco dining spots around Los Angeles, but not all of them are decorated with lush greenery in a natural setting. Dining with the background of a garden landscape can be romantic, sophisticated and magical with twinkling lights hanging from trees to set the mood. 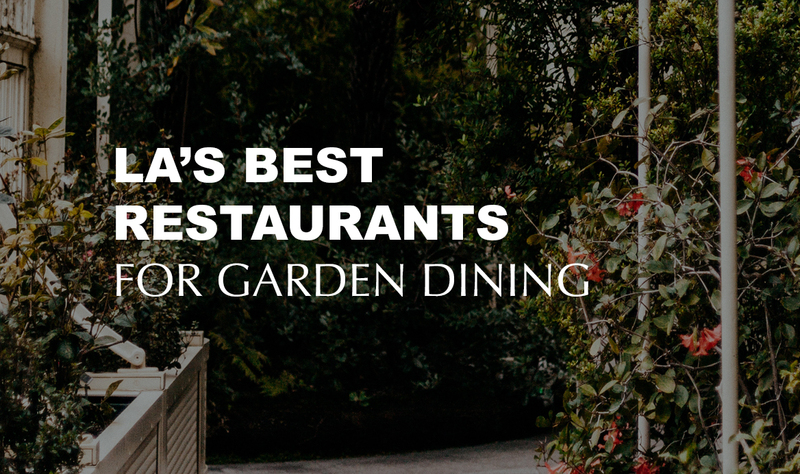 With warmer weather opening up your options for outdoor dining, stop into any of these restaurants for the best garden views for your dining experience. This Venice sanctuary is a staple in LA vegan community. If you happen to not be vegan, their extensive and tasteful variety of wines should be plenty to get you through the door. The outdoor community aesthetic is stellar and makes you feel like you’ve been transported to a little restaurant in the mountains. This elegant hotel lounge and restaurant isn’t just for hotel VIPs, it’s also open to the public. If you’re in the market for a great date spot or somewhere to impress a potential client, The Polo Lounge is a great choice due to its scenic, outdoor garden atmosphere. Sitting down in this walled garden, you would never know that Sunset Blvd. is right on the other side of the hedge. Cliff’s Edge in Silver Lake is a one-in-a-million space that serves modern American cuisine in a chic outdoor atmosphere. Michael’s is a true gem of Santa Monica that has stood the test of time. Recently the restaurant underwent a full makeover and the patio has never looked better with plenty of foliage and soft lighting, creating a truly magical look each night. This Silver Lake hotspot is a hub for community activity. The light and airy atmosphere, indoor and out, is enough to make anybody want to strike up a conversation with the person at the next table. Sawyer’s vibe is infectious and beautiful with a green, open back patio that could put anybody in a cheery mood. This beautiful Japanese-based restaurant and lounge is a staple of luxury dining among Hollywood locals. A full Japanese garden dining setting overlooking Hollywood, a perfectly thought out and prepared menu, and an expert staff make Yamashiro an unforgettable experience. Even though there are plenty of picturesque places to eat around Beverly Grove, The Little Door still manages to stand out. A light and airy garden atmosphere along with an innovative menu make The Little Door the perfect place for date night or just a fun dining experience. If you’re interested in spending a casual warm night somewhere with a beautiful view of the sunset, this is definitely the spot for you. A great beer menu, charming Griffith Park location, and tasty food just a quick walk away make the Beer Gardens at Roosevelt Cafe a summer must.